Make article writing a breeze with prewriting! If you’re thinking, “what’s the deal? Writing shouldn’t be this difficult? !” then you’re absolutely right: you’re spending way too much time writing and not enough time planning. 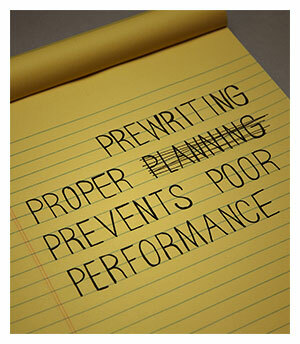 Proper Prewriting Prevents Poor Performance! Prewriting is the planning, researching, and organizing stage prior to the actual act of writing. If you treat the act of writing as a separate task that occurs after prewriting, then you will squeeze more out of your efforts, alleviate frustration, and save time. Use these seven questions as a guide to prewriting to ensure originality, creativity, and quality! Grab a notebook, a whiteboard, or your tablet and answer the following questions before you set out to write your next article. Who’s the article for? Define your target audience – right down to their likes and dislikes. What do they want? Brainstorm by looking for opportunities to provide solutions for your readers. Generate a list based on your audience’s most pressing problems or their needs and wants. If you begin seeing trends or themes, organize your list categorically. Why? Pick a category or an item on the list and describe why the audience wants it (e.g., What ultimate benefit does it achieve? What does it solve?). What headline will best grab your reader’s attention? In under 60 characters, draft a few headlines and consider the tone (such as compassionate, severe, and informative), angle (such as How To, Top Tips, and Why You Should …), benefit-oriented words (such as quick, painless, and easy) that will resonate with your audience. This title may not be the final title you work with, but it will be your guiding vision for the article. What are the main points of your article? Incorporating your experience, research, and insights, outline the main points you want to convey to your reader. What length and format will best suit the topic? Consider which format and article length that will provide the best user experience. If it’s actionable (e.g., how-to, top tips, etc. ), use an ordered or unordered list format and keep the article within 500-700 words. If it’s non-actionable (e.g., industry-related news), consider a bricklayer format that draws the eye down the article with bolded headers highlighting key points between sections. What do you want your reader to do? Consider what the number one benefit you provide your target audience is and what’s unique about it. Use the message in your Resource Box and your call-to-action (such as sign up for a newsletter, visit your website to buy a product, read a related article of yours, etc.). Have all of your answers? You’re ready to write the perfect article! Use The Anatomy of the Perfect Article graphic for a section-by-section guide to ensure you don’t miss a thing. Very nice post! Excellent to refer back to each and every time you write an article. Special one post i think.What a thinking with combination with your writing.I want to follow this steps on my Blog.Then i waiting for result.If result is positive,then your thinking is so better-It Proved again. Excellent post! Very well written and helpful for my upcoming articles. I think one step we often miss is the last one- what do you want your reader to do? What’s the call to action. Thanks for the reminders! Re: #’s 1&2. How am I supposed to have that information? Or were the tips written figuratively? No the tips were not written figuratively. In order to best determine how your product/service is going to do in the marketplace you need to determine who your target audience is. You can begin doing this by building personas for your brand or product. These two questions are an integral part of your marketing plan, so we recommend determining this first before any of your marketing or article writing efforts are wasted. Excellent Tips. I read your article and learn proper way for writing. Thanks a lot for excellent article. The 7 questions sound like the basis of excellent niche marketing homework. If most newbies would consider these questions instead of diving headfirst into affiliate marketing… they’d have alot more success than the alternative route. Very useful for both New and Expert authors. Such a post is very useful. Thanks. Thank you, a great reminder! Excellent writing tips I remember in one of your articles you mention the high amount of responses to your articles! well here we are you readers. Excellent points have been told to get articles approved. I remember a line from a certain movie and it goes like this, “To write well you have to write what you know.” Now I understand that you have to think and plan for you to know. This was a very insightful article!! I’ve been trying to figure out how to properly write articles for awhile, I usually am a story-writer myself so the transistion process was a bit complicated. Thanks! Very informative and proper post on writing better articles. When writing our article, we should remember the anticipation, context and perspective. thanks. Proper planning is definitely the key to preventing poor performance when it comes to creating original, quality content successfully! This article outlines those 7 key points nicely. I will keep this article handy for my personal use and to recommend to other content creators.